Be the first to share your favorite memory, photo or story of Shane . This memorial page is dedicated for family, friends and future generations to celebrate the life of their loved one. 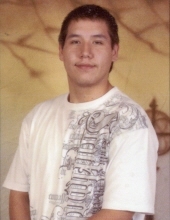 Shane A. NezPerce, 24 of Billings was taken in a senseless act of violence too soon in the early morning of April 6, 2019. He was born on March 29, 1995 and raised in Billings, MT. He left behind his parents, Stuart and Debra Nez Perce of Billings; older brother, Rick (Felicia) NezPerce of Billings; older sister, Kristen (Clarence) Little Wolf-Nez Perce of Billings; nephews, Tayvien and Mikah Nez Perce of Billings; niece, Krissel Little Wolf of Billings; his beloved dogs, Menace, Isis and Angel; uncles, James, Manual and Manuel Camirillo; close friends, Brenden and Mike Neal; also all family and friends too numerous to list but still loved. Shane was preceded in death by his grandmother, Caroline NezPerce; aunt, Genevieve NezPerce; and close friend, Travis Mumma. Shane obtained his GED then immediately began attending MSU City College and after almost 2 years received his Associates Degree in Carpentry. Shane then obtained a job with Renewal Windows by Anderson. He liked his job and that showed in his multiple raises in a short amount of time working for them. Shane also enjoyed and respected his co-workers. Shane embraced every aspect of life and never complained or had a bad word to say about anyone. He was loved by everyone he met, always lending a helping hand wherever and whenever needed. Shane loved his dogs. He was a gentle, calm presence in any room he entered; never a problem starter, no violent acts towards anything or anyone. Shane was a great role model, big brother to all his nieces and nephews; he was always offering words of wisdom and encouragement for their best. Shane loved all his family and friends deeply and was, in return, loved by all of them just as much. He was always there when you needed him. Shane also loved his Cadillacs and the bond it brought with his friends. Shane and his buddies enjoyed cruzin’ and just kickin’ back playing Xbox or PS4 and having a few drinks. Shane did not do drugs and always knew his limits and boundaries. Shane will be deeply missed by everyone! A bright young soul taken too soon! A funeral service will be held at 11:00 am on Wednesday, April 10, 2019 at Dahl Funeral Chapel. To send flowers or a remembrance gift to the family of Shane A. NezPerce, please visit our Tribute Store. "Email Address" would like to share the life celebration of Shane A. NezPerce. Click on the "link" to go to share a favorite memory or leave a condolence message for the family.